Ahhhrrrrr me hearties! Spring is in the air. I can smell it. I can feel it. In spite of the onslaught of rain, Spring is coming. And I for one, am looking forward to it. Work on Little Bear has slowed to a crawl over the winter months, mostly due to inclement weather, but also due to other small things getting in the way. Like moving house. Yeah, we sold, bought, and moved into a new house. We didn’t actually move the house. We left the old one where it was and moved to a new one. A long way too, I might add. A whole 48 seconds by car if you get the one light green. Anyway, in spite of things slowing down I have been working on the boat. In this episode I took a break from not working on the boat and went to the Vancouver Boat Show with Dread Pirate Vlad. We both thought it was a bit of a wash. I don’t think I’ll go again next year. I also introduce the manufacture of a through-hull removal tool. Yes, I know that a ‘step-tool’ would do the job just fine. However, they cost in the region of $70. And I don’t trust them to stand up to the amount of torque that needs to be applied to get the old fittings out. So as an alternative I spent a whopping $6 on some cold rolled steel rod and a welder friend of mine welded up a pair of tools for me. As always, fair winds, following seas, and God bless! Dread Pirate Vlad & I went to the boat today. I wanted to confirm whether the cranking battery held a charge and if it did, did it hold a good charge. As it turned out, it did hold a charge but it was not a significant enough charge to crank the engine to life. I suspect that the battery has reached the end of its useful life. It is an Interstate 27M XHD. I decided to replace it. After doing a bit of googling and reading, I decided that I wanted an AGM battery of some good quality. Die-Hard, Dekka, Optima and a few other brands seemed to fit the bill. 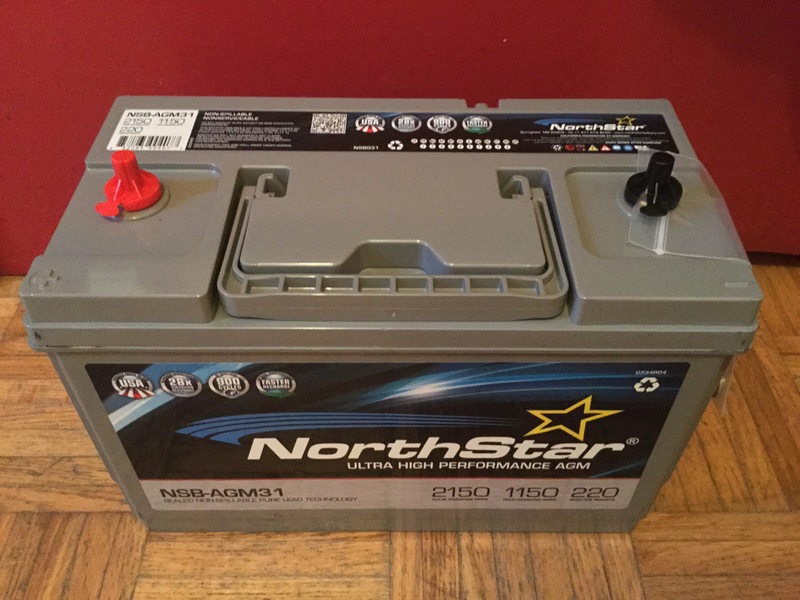 I checked various local jobbers for price brand and so on and then decided to purchase a ‘Northstar’ AGM battery. Made in America using 99.98% pure lead. Almost 2x the cranking power of the nearest competing manufacturer. The downside (there’s always a downside) this bad-boy cost an arm, a leg, an assortment of internal organs, and all my gold crowns. While we were on the boat we realized that she was drifting a bit close to the other boats nearby. As we considered this, a row-boat came alongside and Chris introduced himself as the owner of the blue catamaran. He said the Little Bear has been getting very close to the two catamarans and figured that our anchor has dragged. I thought 400 lbs of concrete was sufficient. However, as the afternoon went on and the tide / current moved the boat it became very clear that our anchor has indeed dragged. This means that our cunning plan and deployment of a cement anchor for our mooring buoy is inadequate. Little Bear falls into the 31′ – 40′ category. As you can see, the recommended amount of weight for concrete is 10x what we put on the bottom. Looks like we’re going to have to fix that asap. But now we’re in a bit of a quandary. We can’t move the boat because the battery won’t crank the engine. If we can’t fire the engine we can’t move the anchor! So with the new battery we’ll be able to start the engine and move the anchor. What we plan to do is to get on the boat on a low tide and haul the chain up as tight as we can get it, then secure it to a cleat or maybe the sampson posts and let the rising tide lift the anchor off the bottom. Once it’s up we can manoeuvre the boat to a more suitable position and reset the anchor. We’re also going to have to add a significant amount of weight to the anchor to stop it from dragging. While we were out there, I tested my new depth / fish sounder. I’d bought a unit about 1 year ago but it never worked properly right out of the box. So I called the manufacturer and they replaced it quickly and without cost. I was very impressed. It works very well and is well suited for a small boat / dingy / inflatable / pontoon boat.